The DX2000's external input function (/MC1) lets you add up to 240 external input channels. Using the DX2000 and MW100's Modus TCP communication functions, you can connect up to 240 channels (external input) from the MW100 as extended I/O via Ethernet. Naturally, any data input by the DX2000 can be monitored and recorded. The DX2000 lets you acquire multipoint data at each process, making management of corresponding files easy and eliminating the need to set up a computer on site. 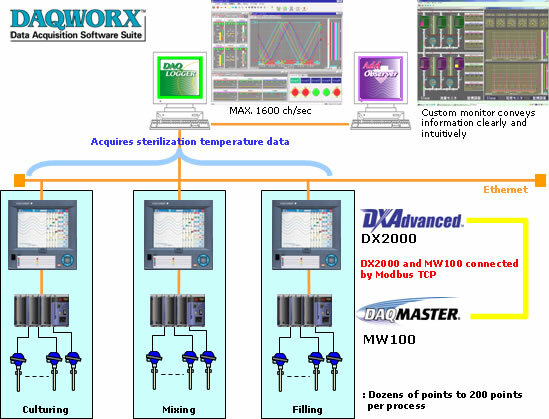 With DAQLOGGER, you can create an integrated data acquisition system of up to 1600 ch/32 units. With AddObserver, you can design custom monitors that convey information powerfully.